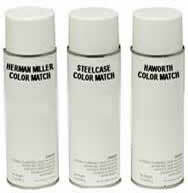 Aerosol touch-up paint offers consistent color matching to OEM production standards. It has excellent mar-resistance and effective adhesion to most surfaces. These paints contain no fluorocarbons and are ozone friendly. Have been specifically developed to quickly and efficiently remove scratches from panel system frames, lateral and vertical files and desk chairs. New wood colors available. * Paint Pens are sold in minimum quantities of 24 per color.